I told you that I am a sucker for tacos. It’s no joke, and I often reiterate to my wife that if I could eat anything any day of the week it would probably be tacos (or pizza). Once of my most recent taco findings was the Mexican Potato Taco. You would never think that something so simple could be so flipping delicious. As I was thinking about making another batch of tacos de papas (potato tacos), I decided to go another route and marry two ingredients that I knew would really work well together for my taco Monday. Kidding, I am not sure what day I made these but I can probably say it was not on a Tuesday. Not that there is anything wrong with eating tacos on a Tuesday! These are not the prettiest of tacos, but having been around chorizo for many years I can guarantee there really is no great picture of cooked Mexican chorizo. Taste, however, well that is on a whole other level! Start by adding water to a pot. Add in your diced potatoes and bring to a boil. Cook the potatoes until fork tender, about 15 minutes. Once tender, strain and set the potatoes to the side. While the potatoes cook, add the chorizo to a large skillet on medium-high heat. Remove the chorizo from the casing and squeeze it into the skillet. Start breaking up the chorizo with a wooden spoon. Add in the diced onions and cook, continuing to break the chorizo along the way. It will look a bit oily. Don’t worry as the cooked potatoes will soak up all of that spiced goodness. Add the drained potatoes to the skillet, and give this a good stir. Reduce the heat to low, cook for about 5 minutes, then load your taco. Take a couple of warmed corn tortillas, spoon in some of the chorizo and potato mixture, and top with avocado, as squeeze of lime, and a wedge of avocado and you have yourself one heck of a great taco. 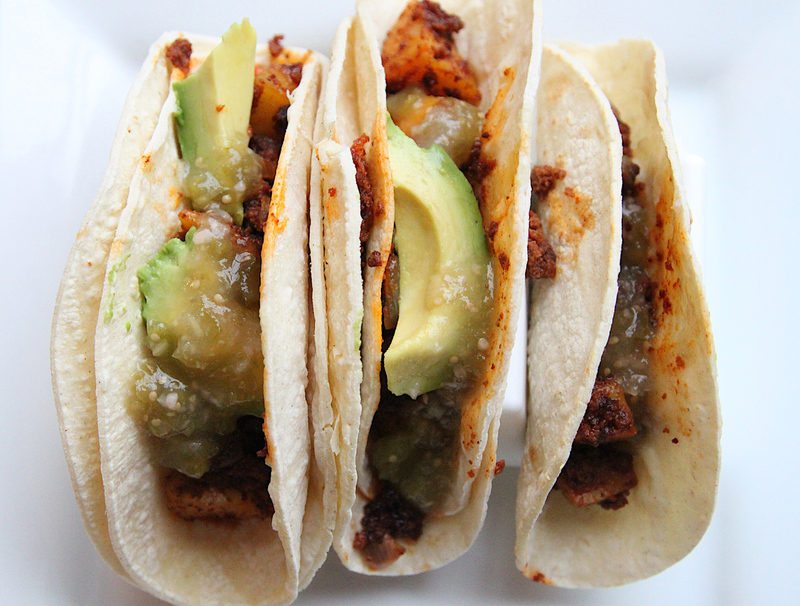 Not only is this super affordable, but it is a nice twist on a standard taco night. Hope you enjoy!